In memory of Kyle and his mission of shining a light on the need for safe spaces for survivors of domestic abuse and their beloved pets. 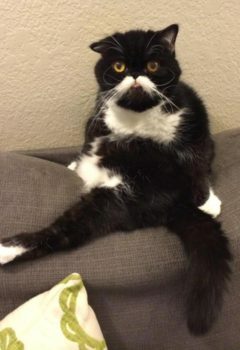 Kyle was a philanthropic, 3-toothed, wild-whiskered, adopted cat who spent his time raising awareness about the need for pet-friendly domestic violence shelters. Kyle was left homeless when a domestic violence incident between his former owners ended fatally. Despite his traumatic past and many health ailments, Kyle had a glowing positivity that reminds us to be thankful every day. Kyle was happiest when sitting on the laps of people he loves, consuming the liquid cat treat Ciao Churu, and getting his nose scratched.